Zimbabwe's diplomatic bid to build solidarity by reaching out to countries in Southern Africa as well as efforts to secure an elusive rescue package after similar moves were spurned by the international community, are insufficient to address the country's intractable economic crisis unless accompanied by sweeping reforms. Harare is now looking within the region for an economic bailout after manoeuvres to secure funding from China hit a brick wall at a time the re-engagement with Western countries has hit turbulence because of the government's poor human rights record and failure to implement reforms. Western nations have influence over the major international financial institutions which the government is engaging over its debt clearance plan, first agreed in Lima, Peru. Government is now seeking to raise US$2,3 billion to clear arrears to multilateral institutions for the country to secure fresh funding. Zimbabwe owes the World Bank US$1,2 billion and the African Development Bank US$600 million. In addition, Zimbabwe owes members of the Paris Club, Afreximbank and other institutions billions of dollars. It also owes the European Investment Bank and other institutions like the German Development Bank. Official figures show Zimbabwe owes US$1,8 billion to the Paris Club and US$1,1 billion to non-Paris Club creditors. Zimbabwe has squandered international goodwill in the aftermath of the November 2017 coup which toppled former president Robert Mugabe. According to human rights groups, 17 people were killed in January in a military-led state operation to crush riots over the government's decision to increase the price of fuel by 150%. The crackdown came after the fatal shooting of seven people on the streets of Harare on August 1 last year by the military. Government's heavy-handed approach drew the ire of the international community, including the British government, which had enthusiastically supported the November 2017 military coup and Harare's subsequent re-engagement drive. At a time there was a chorus of disapproval from the international community, Sadc stood in solidarity with Zimbabwe, choosing to turn a blind eye on human rights violations occurring in the country. Certainly, Zimbabwe needs good neighbours and a shoulder to lean on during tough times, but brotherhood may fail to rescue the economy out of the mire, University of London professor of world politics Stephen Chan said. Chan says that Zimbabwe's economic crisis is in fact crippling Sadc. "Sadc countries have no excess capacity with which to rescue Zimbabwe's economy. 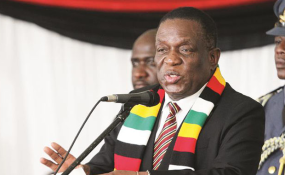 Once they looked to Zimbabwe as a key pillar of Sadc, and the decline of Zimbabwe's economy has in fact damaged the overall capacity of Sadc," Chan said. Last December, Zimbabwe took its begging bowl to South Africa but Africa's second largest economy declined Harare a US$1,2 billion bailout package, citing lack of capacity to part with such an amount. However, Finance minister Mthuli Ncube says government will continue to ask its neighbours for a financial bailout, but South African Finance minister Tito Mboweni has said the economy could only part with US$7 million to offset part of Zimbabwe's World Bank arrears. Chan argues that South Africa and other countries in the region have their own internal economic and social problems as such nothing was left for Zimbabwe. Zimbabwe and Botswana held bi-national commission meetings last week where Harare sought financial injection from its neighbour. Desperate for an economic bailout package positive story, state media claimed that Botswana had extended a US$600 million credit facility to Zimbabwe, something the Gaborone government denied. It later emerged it was in fact a facility for the private sector. Chan says that Botswana is still sceptical of lending Zimbabwe economic support owing to Harare's credit status which was calssifies as "junk status" by S&P Dow Jones late last year. The US this week renewed sanctions on Harare, highlighting the gulf in relations between Western countries and those in Sadc. Midlands State University international relations lecturer Ronald Chipaike said Zimbabwe cannot expect much from its neighbours. "Regional partners' efforts must be applauded, but the problem is that their assistance is a drop in the ocean in view of challenges that Zimbabwe is facing. So Botswana and South Africa's efforts are welcome, but these countries cannot give much since they are also facing a number of economic and social challenges of their own," Chipaike said. "Dialogue and re-engagement are the only way government can become legitimate and approved international citizen again after years of isolation under Mugabe's rule. Whether it is going to benefit economically from the re-engagement strategy depends on the response of critical partners in the West and the institutions which are owed by Zimbabwe." International Crisis Group senior consultant for Southern Africa, Piers Pigou, dismissed prospects of any meaningful economic assistance from the region, adding that Zimbabwe already owed South Africa in unrepatriated ticket sales revenue for South African Airways and other companies. "No country in the region can afford this in terms of having that kind of money. Most importantly, Zimbabwe's record and credit worthiness is not necessarily good, so it would be risky. "We also don't know how much Zimbabwe owes other countries in the region like South Africa in terms of paying them for services like electricity and other soft loans, and until we have that in terms of what kind of credit and how Zimbabwe has honoured those we will know what kind of movement in support Zimbabwe could get in regional financing, but it would be limited," Pigou said. Chan also said that Zimbabwe will not record much progress on the economic front in the absence of concrete political and economic reforms. "Everyone is fed up with Zimbabwe's failure to reform its political and economic institutions. It will take significant reforms before anyone comes forward in any serious fashion," Chan said. Analysts say that it could be suicidal for Mnangagwa to completely turn his back on the West like Mugabe. Pigou added: "The ball is very much in (the Harare) government's court."